The success of 'draw it/build it' that I had with Mathilda has given me a crazy confidence that I can BUILD whatever I DRAW. This way lies giddy joy, disappointment and madness which won't slow me from imagining, drawing, building. 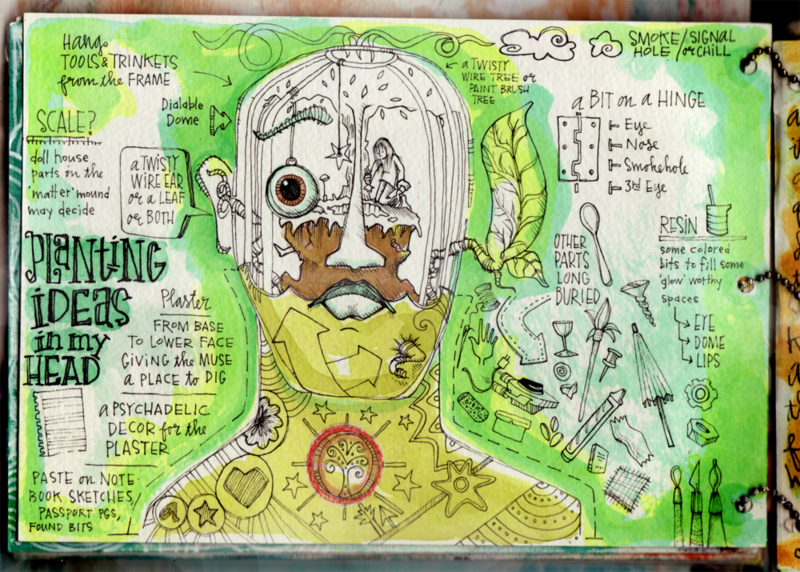 A 3D representation of 'planting ideas in my head' will be fun to build. One big reason for my interest in getting to the building stage is that I'm going to solder the frame together. Haven't done any soldering before. What could go wrong? I'll enjoy shopping for new tools and art supplies. I'll practice and I'll build it. Likely it won't look anything like this scribble but she'll do for inspiration. For help with the soldering bit I'm using Solder Technique Studio: Soldering Iron Fundamentals for the Mixed Media Artist by Giuseppina Cirincione.